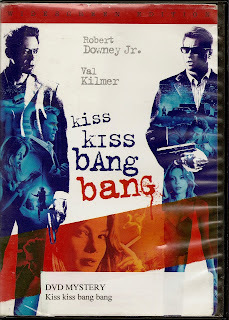 Rooftop Reviews: Movie Review: Kiss, Kiss, Bang, Bang with Val Kilmer and Robert Downey, Jr.
Movie Review: Kiss, Kiss, Bang, Bang with Val Kilmer and Robert Downey, Jr.
A very different movie with a very different approach in its' Direction. The film is told (narrated) by the principal character(played by Robert Downey). The story unfolds in pieces much like "Pulp Fiction." One big difference- the narrator. He fills you in on little things that you might have missed, or in some cases not been told. The story centers on Downey's character, a shady but likeable kind of guy who gets caught up in a burglary which leads to a brief chase which lands him a part in a movie playing a Detective. Simple enough? Not on your life. When he arrives in Hollywood he befriends a woman who turns out to be his high school crush. They were good friends then, but what are they now? Val Kilmer plays a gay Detective in a movie with more twists and turns than the Cyclone at Coney Island. The quick and unusual direction and the use of narration by Robert Downey, Jr. as he stumbles through all of this, make the viewer feel connected and sympathetic to Downeys' character. It's kind of like Frank Capra meets Quentin Tarantino. That alone should makes this film worth watching. Throw in some decent acting by both Downey and Kilmer and this is a highly entertaining film. The only question I have is where was I when this film came out?